Dimensions 1 by 6 by 7.80 in. Amazon.com description: Product Description: Don't miss The Rise of the Guardians, soon to be a major motion picture in theaters November 2012. Forget the bunny trail. E. Aster Bunnymund is on a warpath. 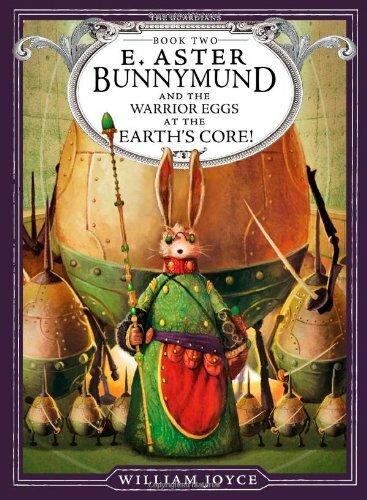 In this second chapter book in William JoyceÃ¢ÂÂs The Guardians series, sometimes you have to crack a few eggs. Pitch, the Nightmare King, and his Fearlings had been soundly driven back by Nicholas St. North and company in the first GuardiansÃ¢ÂÂ adventure. But now Pitch has disappeared completelyÃ¢ÂÂand out of sight does NOT make for out of mind. It seems certain that heÃ¢ÂÂs plotting a particularly nefarious revenge, and the Guardians suspect he might have gone underground. But how can they find him there? Enter E. Aster Bunnymund, the only emissary of the fabled brotherhood of the PookasÃ¢ÂÂthe league of philosophical warrior rabbits of imposing intellect and size. Highly skilled in martial arts (many of which he invented himself), Bunnymund is brilliant, logical, and a tunnel-digger extraordinaire. If the Guardians need paths near the EarthÃ¢ÂÂs core, heÃ¢ÂÂs their Pooka. HeÃ¢ÂÂs also armed with magnificent weapons of an oval-sort, and might just be able to help in the quest for the second piece of the Moonclipper. This second book in The Guardians series is about much more than fixing a few rotten eggsÃ¢ÂÂit brings the Guardians one step closer to defeating Pitch! About: Don't miss The Rise of the Guardians, soon to be a major motion picture in theaters November 2012.